Dishwashers leak occasionally. We know this. However, a frequently-leaking dishwasher that ruins your flooring, burdens you with daily cleanup, and seeps through to lower levels of your home (or the apartment below yours – sorry, neighbor!) need not be a permanent state of affairs. There are three main areas that cause problems in dishwashers: hosing, leak and overflow detection, automatic drainage, and the child-safe lock. Consider the following tips for securing these areas to prevent frequent, destructive leaks. If you have any questions, be sure to contact Simpson’s expert plumbing team for advice. Dishwashers come equipped with two basic hoses, each providing an essential function. The first relays fresh water into the dishwasher and the other drains dirty water out from the bottom of the tub. These hoses vary in make and design, and may be made out of rubber or another flexible material. Most dishwasher manufacturers now double the skin used to build the hoses, or thicken them to prevent leaks. If you are having trouble with your hose, check the age of your model. Old dishwashers may require hose replacement in order to function properly. Modern dishwashers have advanced into the realm of high-tech gadgetry and are programmed to think in addition to their regular duties. What does that mean, exactly? New dishwashers include settings to make sure water is hot enough when you begin the wash cycle to properly clean your items. As far as leak detection is concerned, some models have built-in sensors around the solid-mold base and tub. In the event that the dishwasher develops cracks or becomes unsteady due to leveling, water can seep through these openings, alerting sensors to halt dishwasher operation. If you run your dishwasher at night after you’ve gone to bed, or during the day when you’re out running errands, leaks have more time than usual to seep out of your dishwasher. Many manufacturers now program the appliance to drain if they detect a leak. In the case of a clogged drainage system, some are intelligent enough to detect the issue and stop the dishwasher altogether, saving you a soaked floor. Little fingers can work more mischief than they know! Often, dishwasher leaks occur due to accidental use of the machine, or mid-cycle opening, due to a child’s tampering. Modern appliances have child lock settings and a push-button-controlled panel so that halting the cycle does not mean allowing children entrance to the tub of the dishwasher. These high-tech advancements help to protect both your kitchen and your children, so if your current washer is from the dark ages, investing in a new one can save you a great deal on flood repair costs. 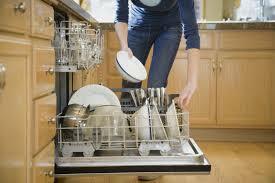 Dishwashers process large loads of water in order to get your dishes sparkling clean. However, dishwasher leaks need not be inevitable. Consider the above when purchasing a washer or having yours serviced, and don’t be afraid to call Simpson Plumbing to troubleshoot any issues that arise.